If I never update this blog again, blame Sunlight Labs. I read their latest blog post and now I can’t… stop… playing… with… Scout. 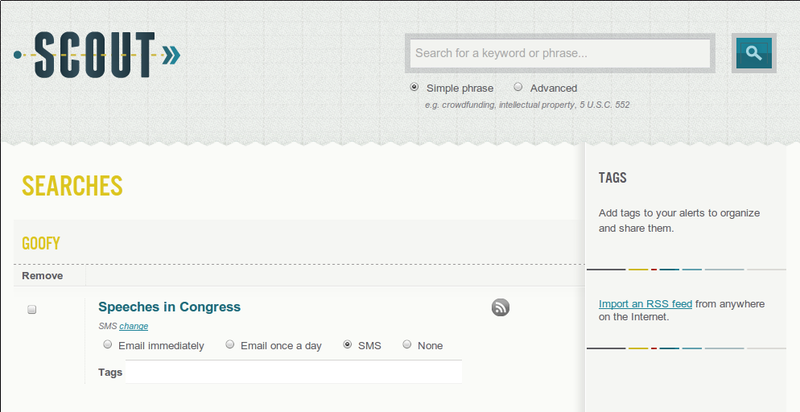 Scout, at https://scout.sunlightfoundation.com/, is an alerts service which gives you updates on federal and state legislation, as well as speeches in Congress and Federal regulations. Federal legislation I’ve found all sorts of tools for, but when I was poking around for a place to get state legislative updates last year, I had a heck of a time — it was pretty much hit and miss and seemed to depend a lot on what state you’re in. 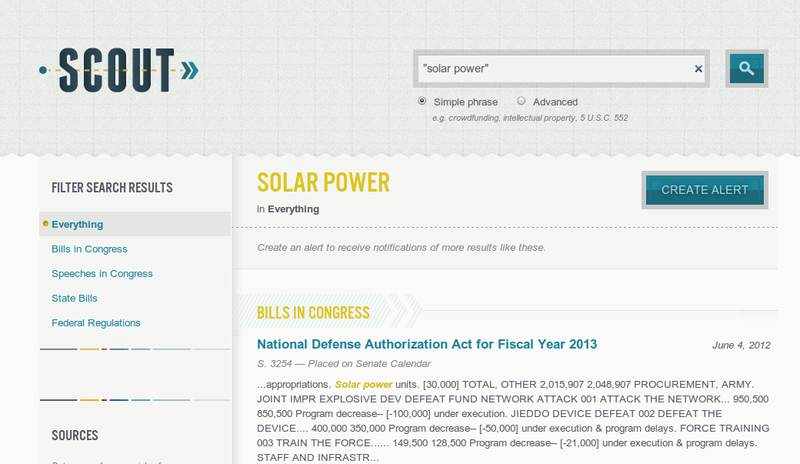 Scout starts out looking like a search engine so I did a simple search for “solar power”. The results page lets your break down your search results into several sections: bills in Congress, speeches, in Congress, state bills, and federal regulations. Choosing one of these allows you to do a little more delineation; for example, choosing to look at bills in Congress lets you choose what stage they’re at (passed, vetoed, etc.) and choosing state bills allows you to specify particular states. Information in the search results is minimal; looking at solar energy bills in Montana provides brief information on the three bills that were returned, but additional information and the full text of the bill is no more than a couple clicks away. Similarly, searching for the number of times the word goofy has been used in congressional speeches (apparently former senator Byron Dorgan likes that word a lot) provides a brief context of the speech in the search results but the original speech is only a click away, with additional clicks to the source and the original GPO transcription with all its Green Acres references intact. So the searching is good but the alerting is great. To use alerts you’ll need to have an account (it’s free) and if you want to get SMS alerts you’ll have to verify your phone number (Scout sends you a text and you enter the verification code from the text.) To set up alerts just do your searches. For every search result you’ll see a blue “Create Alert” button above the search results. Click that to save an alert. All your alerts will be gathered in one spot, and you can edit them there to specify whether you want your alerts by text, e-mail, or not at all. I immediately set up several alerts for state legislation; hopefully this’ll be easier for me to keep up with what’s going on in my state than what I’m using now, which is a couple of push notifications and lots of manual review. Thanks, Scout! What a great find! Thanks for sharing.